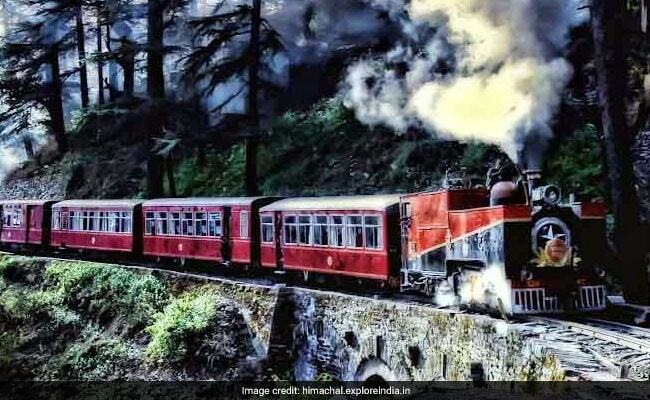 Kalka-Shimla Train Network: Sanjeev Sharma's tryst with leopards has gained him popularity at the quaint station which is surrounded by heritage sites on the Kalka-Shimla Railway, a UNESCO World Heritage track. Station Superintendent Sanjeev Sharma draws attention of curious tourists as trains roll into the Gumman Railway Station in Himachal Pradesh's Parwanoo district. Mr Sharma's tryst with leopards has gained him popularity at the quaint station which is surrounded by heritage sites on the Kalka-Shimla Railway, a UNESCO World Heritage track. Gumman Railway Station, which is 3 km by road from Kalka, falls on arguably one of the most scenic train routes of Northern India. The latest sighting was three days ago, right on the platform of the station, when a train was coming in. "A guard saw it on the platform when the train was coming at 4 am. The animal left after picking up an injured dog," said Mr Sharma, who has been a railwayman for the past 24 years,. The last four times the leopard came visiting, he and a pointsman (track maintenance worker) were the only two people in the vicinity of the track . Mr Sharma lives nearby with his wife and children and he has forbidden his son and daughter, who are both 12 years of age, from playing outside in the evenings. "I am scared. I am responsible for my men. I can keep my children indoors, but these men have to work. Also, we are here from 3:30 am to 11:30 pm which means we are extremely vulnerable in the morning and at night. Though I shot the video as evidence, it was a chilling experience. I have been telling my stories to tourists, but I hope they don't end up involving a tragedy," said Mr Sharma.